Beverly Strohmeyer serves as Executive Director of the Missouri Arts Council, a state agency, and a division of Missouri Department of Economic Development, housed in St. Louis, Missouri. Under her leadership, the Missouri Arts Council has been successful in obtaining increased legislative funding, and developed a strategic plan to reach unserved and under-funded legislative districts with state arts funding. She served as the Missouri Arts Council's Interim Executive Director (2000 and 2004-2005), and was appointed Executive Director in January 2006, while continuing to fulfill the duties and responsibilities of Assistant Director for Programs from 1999 until January 2010. Strohmeyer came to the Missouri Arts Council in 1997 to serve as Program Specialist for the Council's Community Arts and Touring Programs and quickly took on the additional responsibilities of managing Missouri Arts Awards and serving as liaison to the Missouri Arts Council's Arts Education contracted programs and to the Missouri Humanities Council's Small Museum Development Charette Projects. She was promoted to Assistant Director for Programs in 1999. Strohmeyer, a native Missourian, has over 35 years of experience in arts administration. She was Executive Director of Southeast Missouri Council on the Arts (1984-1997), the oldest arts council in Missouri. During Strohmeyer's tenure as Executive Director and curator of the Council's Gallery 100, southeast Missourians were introduced to exhibitions of new paintings, sculpture and photography not previously seen in the region. National and regional juried exhibitions were hosted at Gallery 100. 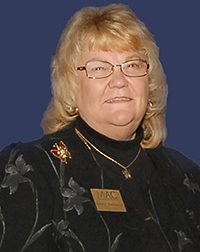 Strohmeyer began her career in arts administration in 1979 as the volunteer chairman for Southeast Missouri Council on the Arts' Art & Crafts Fair, the organizations' major fund-raising event. She also served on the Board of Directors. Prior to coming to the Missouri Arts Council Strohmeyer served on Missouri Arts Council Citizen Advisory Panels for nine years, reviewing Community Arts Program, Touring, and Multidiscipline grants, and served on the Board of Directors of Missouri Association of Community Arts Agencies. She has served on grant review panels for the Arkansas Arts Council. Strohmeyer is a member of the Missouri Chamber of Commerce and Industry's Tourism Policy Council. As Executive Director of Missouri Arts Council, Strohmeyer also sits on the Board of Directors of Mid-America Arts Alliance, a nonprofit organization that supports and stimulates cultural activity in a six-state region including Arkansas, Kansas, Missouri, Nebraska, Oklahoma and Texas. She currently serves as Vice-Chair of the Board of M-AAA, and Chair of the State Arts Agency Executive Directors and Chairs Committee. She has also served on the Nominating Committee and Budget and Planning Committee of the National Assembly of State Arts Agencies. Strohmeyer also has an extensive volunteer career including serving as President of the Concordia Lutheran Middle School Board, on the Fellowship Board of Historic Trinity Lutheran Church, and working with the Cape Girardeau Chamber of Commerce Education Committee, Southeast Missouri State University Arts Task Force, and the Southeast Missouri Hospital Arts Program Committee. Strohmeyer was honored by the Southeast Missouri Council on the Arts in 1992 with their Otto F. Dingeldein Award for Outstanding Achievement in the Arts, and in 2012 received a Lifetime Achievement Award for support of arts education from the Missouri Alliance for Arts Education.